There have been few feminist analyses of the abuse and neglect of elderly women per se. We think that most standard gerontological studies of the abuse and neglect of aging people have not disaggregated the group – elderly people – according to their differences in gender, race, ethnicity, social status, economic well-being, and so on. In contrast, feminist theory has certainly paid attention to gender differences, but many analyses have been surprisingly ageist. Feminists still focus on issues of concern to younger women, giving short shrift to, or simply ignoring, the issues of many older women: chronic diseases, depression, loneliness, and confrontation with their mortality. 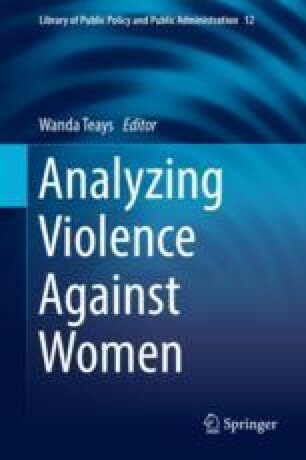 In this chapter, we point out some of the ways that physical abuse and neglect differ for elderly women. We also argue that feminists, indeed everyone, should be especially concerned about the issues of elderly women as a matter of social justice. Because women still have much heavier caregiving roles and responsibilities than men, they generally reach old age poorer, sicker, and more stretched than men. Thought and efforts must be expanded in order to achieve the continually elusive goal of gender equity. American College of Obstetricians and Gynecologists, Committee Opinion. Elder abuse and women’s health, 568. https://www.acog.org/Clinical-Guidance-and-Publications/Committee-Opinions/Committee-on-Health-Care-for-Underserved-Women/Elder-Abuse-and-Womens-Health. Accessed on 3 Feb 2018. Centers for Medicare and Medicaid Services. 2015. Nursing home data compendium 2015. Available at https://www.cms.gov/Medicare/Provider-Enrollment-and-Certification/CertificationandComplianc/Downloads/nursinghomedatacompendium_508-2015.pdf. Commission on Long-Term Care. 2013. Report to the congress. Available at http://ltccommission.org/ltccommission/wp-content/uploads/2013/12/Commission-on-Long-Term-Care-Final-Report-9-26-13.pdf. Johnson, Christopher. 2015. Elder abuse and self abuse. www.christopherbjohnson.com/2015/02/19/elder-abuse-neglect-self-abuse. Accessed on 3 Mar 2018. May, Julia. 2014. Shocking numbers of elderly women being abused in aged care homes. https://www.theage.com.au/national/victoria/shocking-numbers-of-elderly-women-being-abused-in-aged-care-homes-20140706-3bg9w.html. Accessed on 20 Feb 2018. Nursing Home Abuse Center. 2018a. Elder abuse statistics. https://www.nursinghomeabusecenter.com/elder-abuse/statistics. Accessed on 1 Mar 2018. ———. 2018b. Elder abuse types. https://www.nursinghomeabusecenter.com/elder-abuse/types. Accessed on 14 Feb 2018. ———. 2018c. Physical abuse. https://www.nursinghomeabusecenter.com/elder-abuse/types/physical-abuse/. Accessed on 13 Feb 2018. ———. 2018d. Emotional abuse. http://nursinghomeabuseguide.com/elder-abuse/emotional-abuse/. Accessed on 13 Feb 2018. ———. 2018. Women and elder abuse. http://nursinghomeabuseguide.com/women-and-elder-abuse/. Accessed on 13 Feb 2018. Thompson, Kate. 16 February, 2003. Abuse of elderly women on the rise. Women’s News. https://www.feminist.com/news/news160.html. Accessed on 1 Mar 2018. United States Department of Health and Human Services. 2005. A profile of older Americans. https://www.acl.gov/sites/default/files/Aging%20and%20Disability%20in%20America/2005profile.pdf. Accessed on 22 Feb 2018. ———. 2017. Emotional and verbal abuse. https://www.womenshealth.gov/relationships-and-safety/other-types/emotional-and-verbal-abuse. Accessed on 17 Feb Apr 2018. World Health Organization Media Center. 2016. Elder abuse. https://www.who.int/medicacenter/factssheets/fs357/en. Accessed on 28 Feb 2018.